Yes! We want to be recognized for the strides our organization is making towards alleviating traffic congestion and improving air quality in New Jersey by helping commuters. Please look through the following levels and requirements to determine, which level you are eligible for. Establish and maintain a relationship with a local Transportation Management Association (TMA). Designate an on-site point of contact for employee commute inquiries. Place alternative commute information in new-hire packets. Encourage employees to register for TMA traffic alerts or 511NJ.org or disseminate traffic alerts to your employees. Provide access to a site-specific commuter information display. Regularly promote commute options and TMA incentives through regular memos, postings, e-mail, Intranet or other employee communications. Encourage employees to register their alternate commute with a local TMA. Host at least one commuter information event at your worksite. Host at least one vanpool or carpool formation meeting at your worksite. Host at least one TMA Lunch and Learn presentation. Offer an informal flextime program. Offer an informal telecommuting program. Working with a TMA, conduct an employee commute survey. Host or sponsor TMA events/programs such as National Bike to Work Month, National Walk Month, Car Free Week, or Distracted Driving Awareness Week at the worksite. Provide financial or staff assistance for TMA-sponsored community events. Host two or more commuter information events at your worksite. Host two or more TMA Lunch and Learn presentations. Host two or more on-site vanpool/carpool formation meetings. Provide a designated outdoor bicycle parking area or an appropriate indoor area. Provide employees access to basic bike maintenance tools. Provide preferential parking for vanpoolers or carpoolers. Offer a formal flextime program. Offer a formal telecommuting program. Offer a formal compressed workweek policy. Provide pretax payroll deductions for commuting cost for employees (vanpool, transit and/or bicycle commuters). Provide Emergency Ride Home for employees who have exceeded the maximum number of TMA-provided rides. Sell transit passes on site. Provide on-site amenities such as food service, dry cleaner, ATM/bank, sundries or showers. 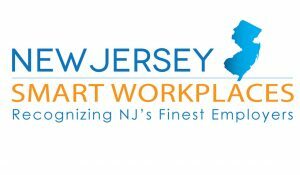 I have met the requirements for the Gold Level NJ Smart Workspace. Employers must achieve FIVE Bronze Level activities and five Silver Level activities. Telework or compressed work week program that reduces commute trips by 3%. A monthly employer subsidy toward transit passes. A monthly employer subsidy/benefit for employees who carpool or vanpool. Partnering with local gyms, Ys, or other groups to provide off-site showers. Supplement parking by partnering with local organizations to create private park and rides. Provide fleet of bicycles for employee use or rental. Provide electric vehicles for employee business use. Provide electric vehicles and charging stations for employee use. Contact your TMA for more suggestions. By checking this box, I have reviewed the commuter activities that are checked and confirm that we meet the criteria for the recognition level chosen. By checking this box, I acknowledge that all the information indicated on this form is correct.